I hope everyone is having a great week. Mine has been insane at work, but I’m almost through it! 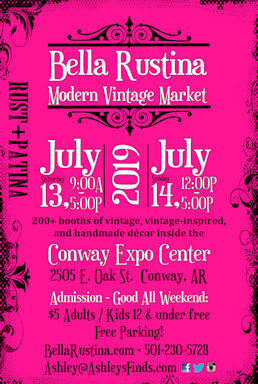 I’m taking off work Friday to go the Farm-Fresh show in Prairie Grove. This year the event is supposed to be bigger and will take place in a field with an old barn. Should be cool! This is a very nice sale full of goodies: Some very nice electronics, a Pioneer receiver, Norman Lab speakers, a JVC turntable & more, cameras including Minolta,vintage Atari & Nintendo, Hermes vintage typewriter, Peavey microphones, vintage clarinet, several televisions, 12 gauge & 20 gauge shotgun shells, lots of kitchen appliances, a set of Tramontina cookware, a vintage set of Austriaemail cookware, Tupperware, lots of cookbooks, sets of dishes, lots of kitchen gadgets & utensils, set of china & lots of glassware, set of TV trays, large selection of books including 1970 yearbooks, queen & king linens, lots of nice towels, lots of lake house decorator items, signed duck prints, lots of other art, several antique prints, several original artwork pieces by owner, lots of toys including a few vintage, a lot of games, and an antique childs playpen, a bassinet, vintage kids clothes, mens and womens clothes, Camo hunting clothes, a tuxedo, Christmas decorations, fabric, 6 boxes of patterns a White sewing machine, and a Bernette 500 embroidry sewing machine with scanner and cartridges, some nice area rugs including wool, 2 pcs of Hartman luggage, brass & copper, old bottles and banks, vintage water skis, 2 hard travel golf bags, vintage set of Wilson staff irons, 3 sets of kids golf clubs, Bertha Woods, Razorback putter, golf shoes, wall clock, a fireplace tool set, many lamps to choose from including a nice hanging lamp, lots of mirrors, a highchair, 2 sets of barstools, set of 6 kitchen chairs, 2 matching Lazy Boy recliners (fishing scene), 2 sets of pine coffee tables & end tables, 3 sleeper sofas, one oak sofa table, set of 6 maple Windsor chairs, 4 antique cane bottom chairs, a nice lift chair, 2 wingback chairs, several occasional chairs, Ashley furniture pine desk, a mahogany music cabinet, a wicker & wood settee, a very nice pine armoire, 2 pine chests, a pine toy chest, a 3 pc pine queen bedroom suite, an antique mahogany bed, 2 king headboards, 3 pc bedroom suite, a Frigidare electric dryer, a GE washer, bathseat and walker, 2 bicycles, an electric blower, lots of flower pots, a GMC powerlift for an outboard motor, a bandsaw, 2 sleeping cots, a Coleman campstove, a painter’s spotlight, also a metal patio set with 4 chairs, and an older model Murray lawnmower auto drive 42″/20HP. Contents of a large Pleasant Valley home, wonderful oriental rugs (Heriz, Bokhara, Karajan, Chinese) 2 librairies filled with great books (collectors, reference, fiction, history) Minton, Worcester, Noritake china, 1965 Rothchild Wine bottle and stand, wine rack, Waterford, collectables of all types, crystal, sets of china, David Winter cottages, Chippendale dining chairs, glass top dining table, Century and Henredon tables, server, entry table, Hoosier cabinet with leaded glass inserts, Mission sideboard and desk, Clocks, king and twin beds, French vanity, easels, drop front desk, wicker sofa, bakers rack, oak table and chairs, roll top desk, Pictures, lamps, kitchen, household and workshop items, 52” Sony flat screen TV, quality stereo equipment, speakers, linens, Great patio furniture, and much, much more! Packed house! Sideboard with hutch, round claw-foot dining table, 2 sofas, 2 matching red armchairs, lit china hutch, glass-top sofa table, beautiful rectangle dining table & chairs, jewelry, dolls, ant. baby grand piano by George Steck & Co., giant dollhouse/bookcase, Wedgewood china, Regulator wall clock by Ingraham, occasional tables, books, 2 panel TVs, Wii, retro Lego phone (functional), LPs, bookcases, drafting table, sm. Mid-Cent. Mod. desk, computer monitor, lg. painted storage armoire/entertainment cabinet, bar chairs, Spode Christmas dishes, LOTS of kitchen, cooking utensils, knives, sm. appliances, side-by-side fridge, linens, TONS of great women’s clothing & shoes – formal dresses, Anthropology, Gap, Abercrombie, Limited, Banana Rep., Express, dance competition outfits, Bloch tap & jazz shoes, old trunks & footlockers, designer bags – Coach, Hobo, Diane Von Furstenberg; Qn. headboard & matt. set, Steiff animals, modern dolls & toys, glass-top corner computer desk, home decor, holiday, & so much more!!! 20% off this weekend! Packed with great estates. Phillip LaVerne bronze table, continental and American furniture, Steuben, Baccarat, Waterford, Royal Doulton, Lenox, Wedgwood, fine and costume jewelry, sterling and Silver plate, photographs and ephemera, vintage comic collection, retro furniture, great oak files, and much more! Railroad light, Noritake dishes, vintage clothing, hats, Fire King, and lots more. Two Estates brought to one location, 98 years of collecting, some of everything, too. too many to list. 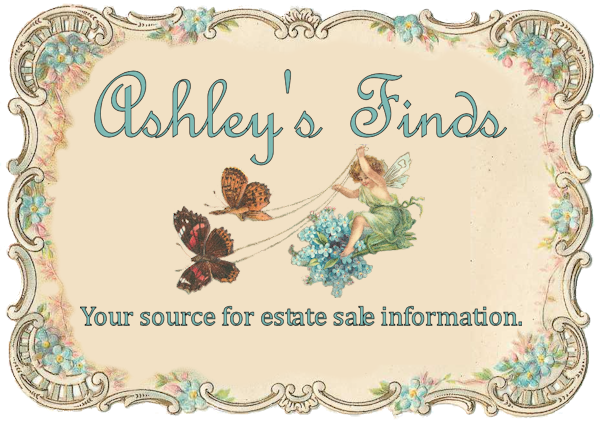 Items consisting of antique glassware, lots of vintage Avon products, sewing machine, board games, tools, saw, cooking utensils, refrigerator, weed eater, lawn mower, Jewelry. 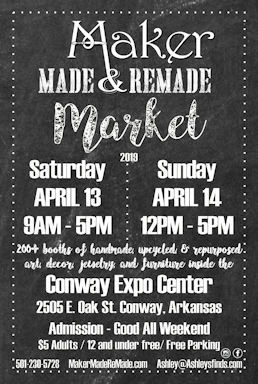 Open-air vintage market for vintage (20+ years old), antique (50+ years old) and upcycled/recycled items. Items to include: Walnut Victorian wash stand, Walnut Victorian dresser, Bird’s eye maple vanity, Walnut 4 panel room divider, Mahogany lingerie chest, Oak Davenport desk, Medallion back Italian style chairs, French tapestry covered 2 cushion sofa, large gold framed mirror, Walnut & Mahogany fern stands, La-Z-Boy recliners (5), Queen Anne dining table & 4 chairs, Walnut Victorian lamp table, Eastlake chest w/ mirror frame, several wooden clock shelves, Berkey & Gay Empire dressing table,N.Y. Mets team signed baseball & other signed baseballs, Poppy Trail “Red Rooster” dinnerware, old wooden fishing lures, large tackle box stuffed full, several pcs. of McCoy & Redwing pottery, 40+ pcs. of Frankoma pottery, several pcs. of Fenton glassware, G.I. Joe action figures & collectibles, Tonka & Caterpillar construction toys, several cookie jars, nice arrow head collections, vintage games & puzzles, John Wayne & Star wars items, reproduction movie scripts,Marx hobby horses(2), conductor’s hat from Little Rock, home made wagon w/ John Deere colors, Speed Queen washer & Kenmore electric dryer, boxes of 33 1/3 rpm records, space related books & collectibles, vintage lunch boxes & thermos bottles, salt & pepper sets, choice on the rolling racks, furniture that needs TLC,storage totes, framed & matted art works, decorator items, and a whole lot more! PARTIAL LISTING: ANTIQUES & COLLECTIBLES: Carved Oak Dresser; Gold, Sterling and Costume Jewelry; Radio, Lamp and Wicker Tables; Quilts, Scarves and “Nice” Linens; Beaded Indian Bow and Arrows Set; Umbrellas; Fans; Hair Combs; Singer Treadle Sewing Machine; Roseville; Hull; Germany Chocolate Set and Other Hand Painted China; Cake Plates; Old Pictures; Boopie and Forest Green Glasses; Breyer Horses; Iron Cookware; Disney Items; Primitives; Collector Price Guide Books; Oak Court House Bench and Chairs; Plus Lots More!!!! GUNS: 460 S&W Mag. Revolver; High Standard 22 Auto; 10 Ga. Turkey Gun; Plus Ammo; FURNITURE: 5 Pc. “Broyhill” Bedroom Suite; King Bed; Leather Sofa and Loveseat; 8 Pc. Oak Dining Room Suite w/China Cabinet; Corner Cabinet; Occassional Chairs; Breakfast Table Set; Freezer; Refrigerators; Rockers; Chests and Other Furniture Items!!! Housewares & Cookwares; Decor Items; Gas Grill; Vacs; Lamps; Flatware; Books; Plus Lots More!!! PATIO FURNITURE–Planters; Bird Bath; Swing; Iron Tree Bench; Iron Table; Trellaces and More!!! PORTABLE CAR SHED; Portable Stainless Steel 4 Compartment-Self Contained Sink Unit w/Water Heater and Tanks; SADDLES & TACK: Custom Made by E.P. Ericksen–Ennis, Mt. Heavy Duty Saddle; Big Horn and Circle Y Saddles; Tack; Spurs; Plus More!!! FARM: Gates; Pipe; Wire; Dog Houses; Feeders; Plus More!!! SHOP & TOOLS: Shop Smith w/Attachments; “Nice” Workbench; Vises; Grinders; Air Compressor; Wire Welder; Yard, Hand and Power Tools; Hardware; Power Washer; Ladders; Sandblaster; Shelving; 9 Gallons Alky. Enamel Industrial Coating; Bins; Plus Much More!!! CUB CADET Riding Lawn Mower—140 Hours “Very Nice”; 3 PT. EQUIPMENT: Bush Hog; Disc. ; Plow; Mower; Blade; Seeder; Spray Tanks; Hay Fork and More!!! -Electronic Scales -and SO MUCH MORE !! With Reserve: 2002 Buick Lesabre, ONE-Owner with just UNDER 43,000 miles. We have guns,old glass,lots of name brand cookies jars ,vases ,glass and more,we have a cute black BMW we will have boats ,barber chairs ,tools and much much more keep a eye on page will have more stuff to post. We still have more pictures to take and put online so keep looking at the web page. We will be putting more pictures on this week. We have more guns and barber chairs to put on. Some items that will be at auction are: Furniture, assorted chairs, Pottery, McCoy, glassware, lots of shot-glasses, steins, lamps, S/P Shakers, pictures, 2 bicycles, new chainsaw, lots of choice items, and much, much more. Auction every Saturday night. We have furniture, glassware, new and used items, tools, outdoor items,jewelry, and much more.